It couldn’t be easier to use the Metrolink tram service to travel to and from the airport, as it stops right in The Station at the airport itself. It is then just a 5 - 15 minute walk to get to and from the terminals, depending on which one you’re visiting, with moving walkways throughout. With over 90 stops, the Metrolink connects all parts of Manchester, no matter where you’re heading. Trams run direct from the airport to just outside the city, where you can change for a short tram ride to the centre. 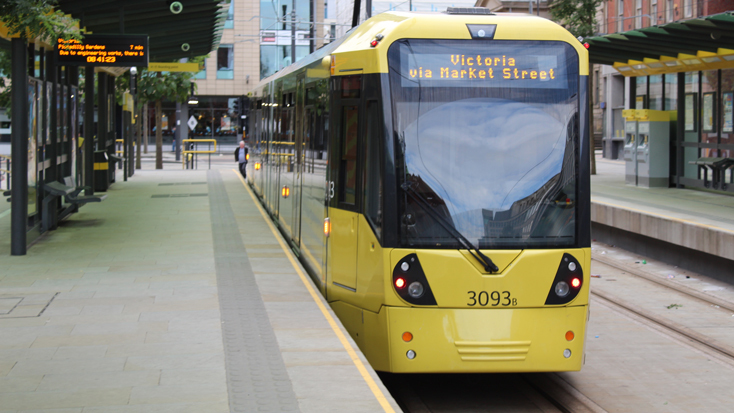 Alternatively, there are frequent connections to the rest of the network, with trams heading towards Altrincham, Bury, Ashton-under-Lyne, East Didsbury, Eccles and Rochdale. How often do the services run? Trams run every 12 minutes, but this could vary on public holidays. You can find information about the first and last tram times on the Metrolink website. What time are the first and last trams to Manchester Airport? Trams run to and from the airport throughout Greater Manchester, so the first and last tram times will be dependent on the station which you're travelling to/from. If you're heading to Ashton Under-Lyne, trams run every 6 minutes, or otherwise every 12 minutes; all tram times can be found at TFGM. What is Manchester Airport Metrolink? The Metrolink at Manchester Airport is the tram line which provides connections throughout Greater Manchester. The Metrolink station is located within the train station; only a short walk between all three terminals. For further information on tram services and timetables please see TFGM.